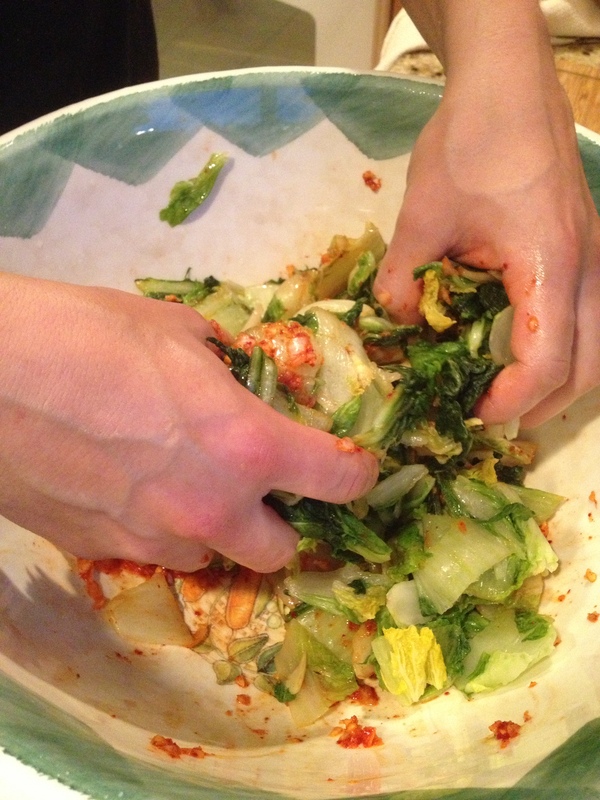 (Written by PaleoBoyfriend) There are many different ways to make kimchi and you can use many different vegetables. 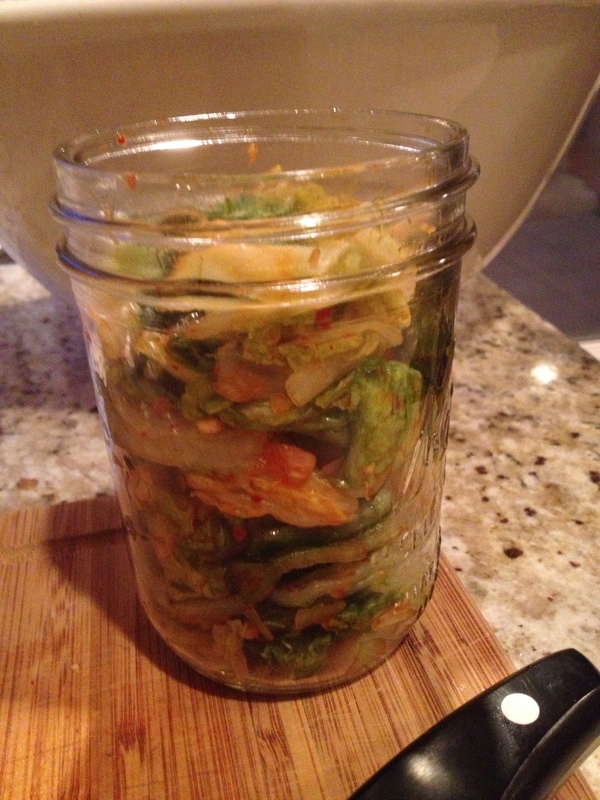 Fermented foods are super healthy and I feel can have a place in the paleo lifestyle. 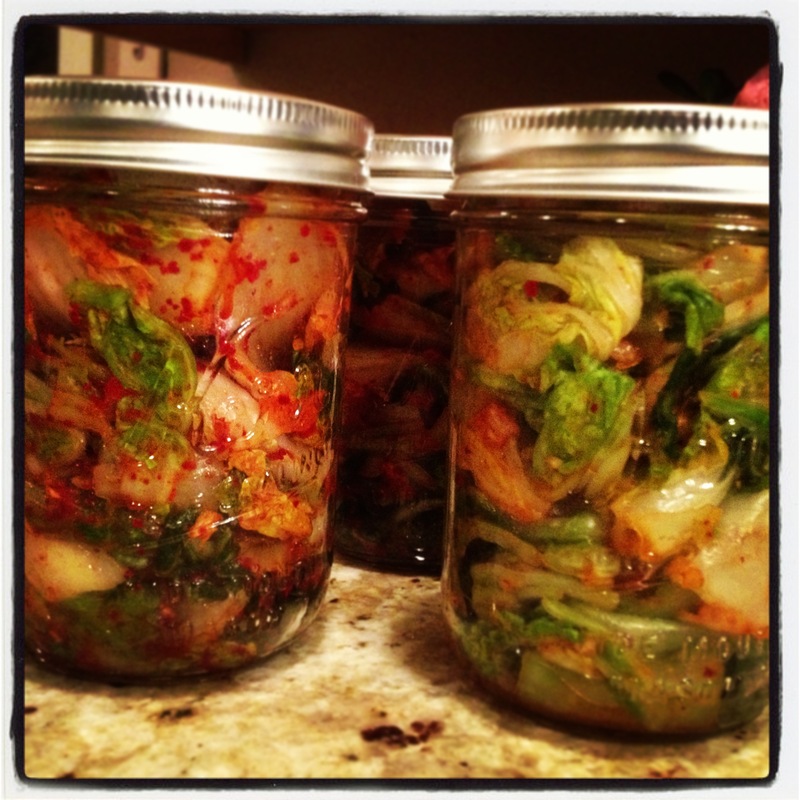 The problem with store bought kimchi is that they all contain sugar, which is not healthy and is used in order to speed up the fermentation process thus making it to store shelf quicker. 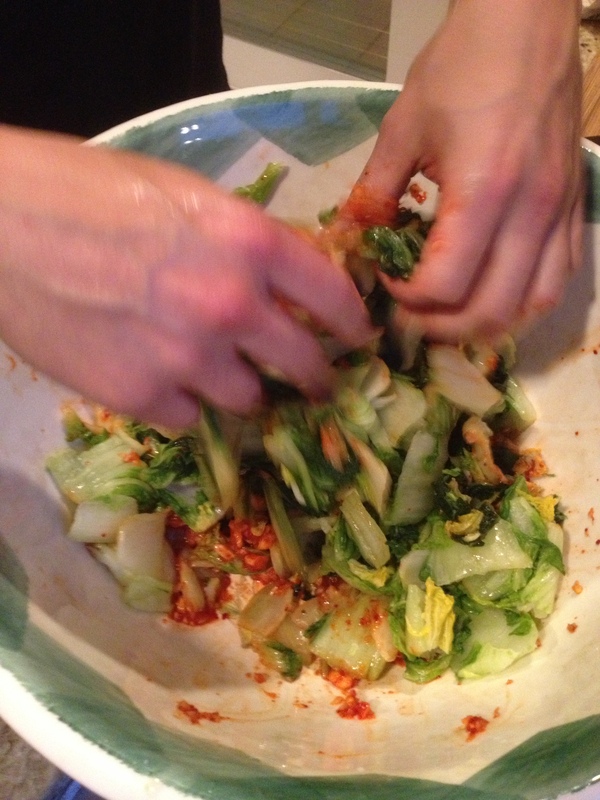 It is for this reason I decided to make my own kimchi, as home made kimchi typically does not have this ingredient. 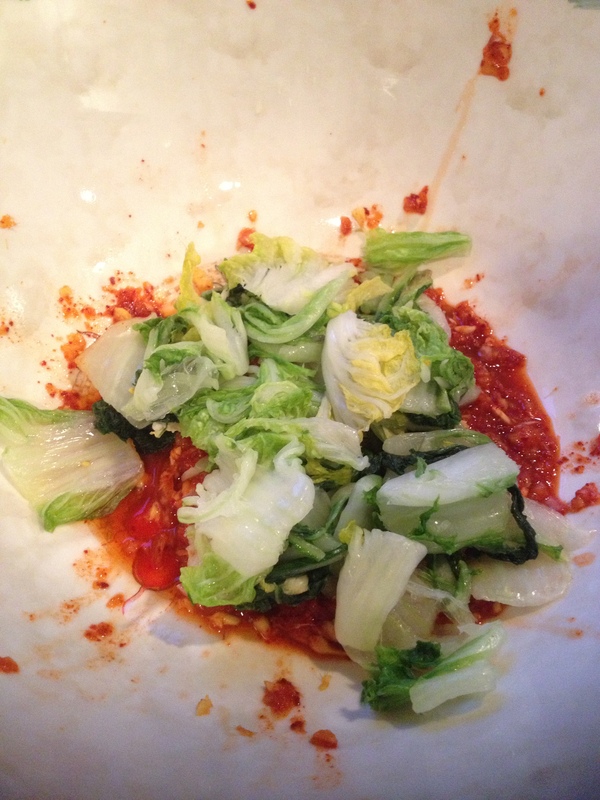 It is surprisingly easy to make and is very delicious. 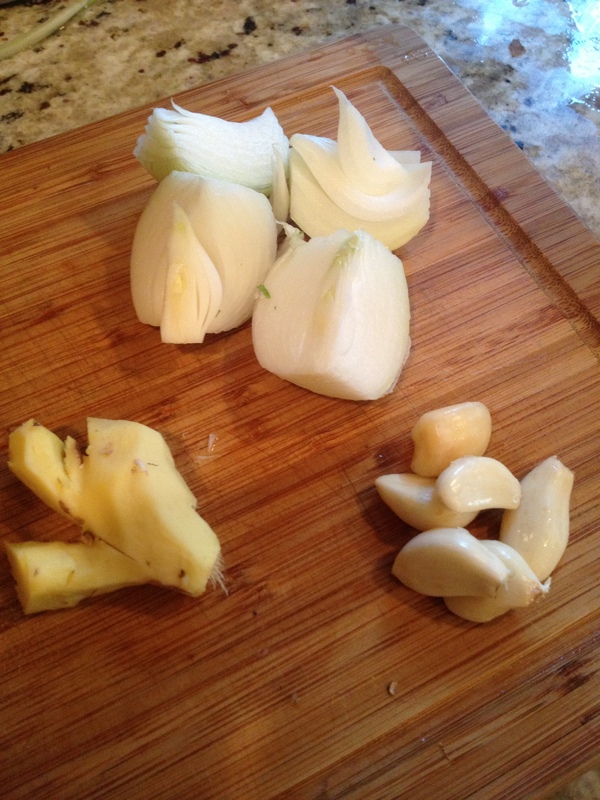 onion, I typically use green onion but didn’t have any so white onion was used instead, it really doesn’t matter. 1. 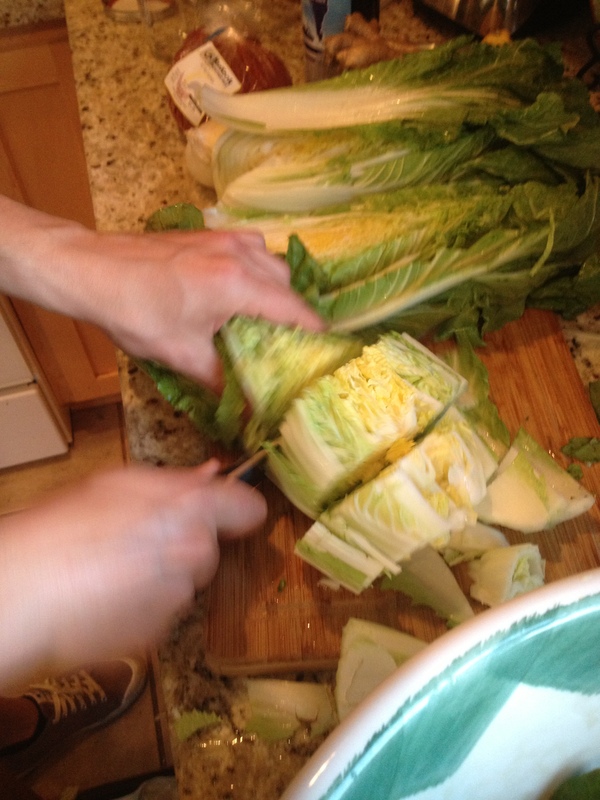 Half the cabbage, de-core, then chop as shown above. 2. 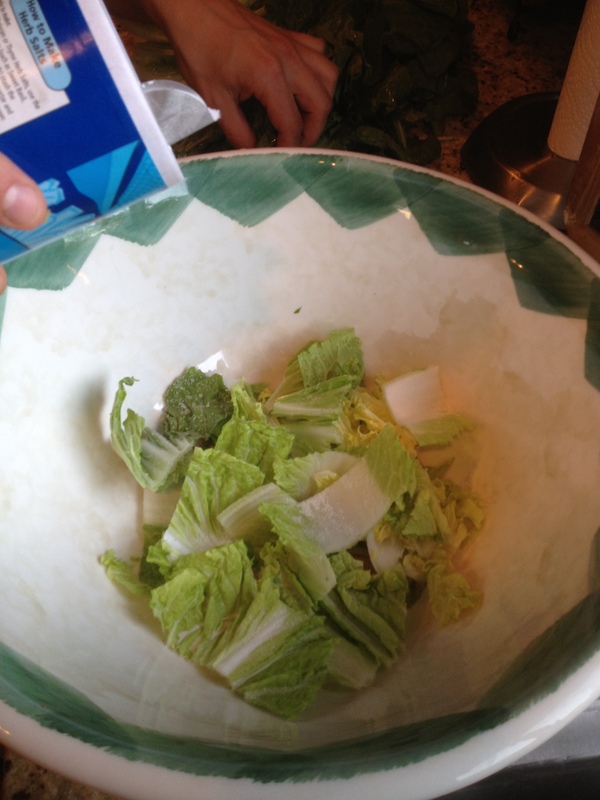 In the large bowl, add a layer of cabbage then liberally pour on sea salt. 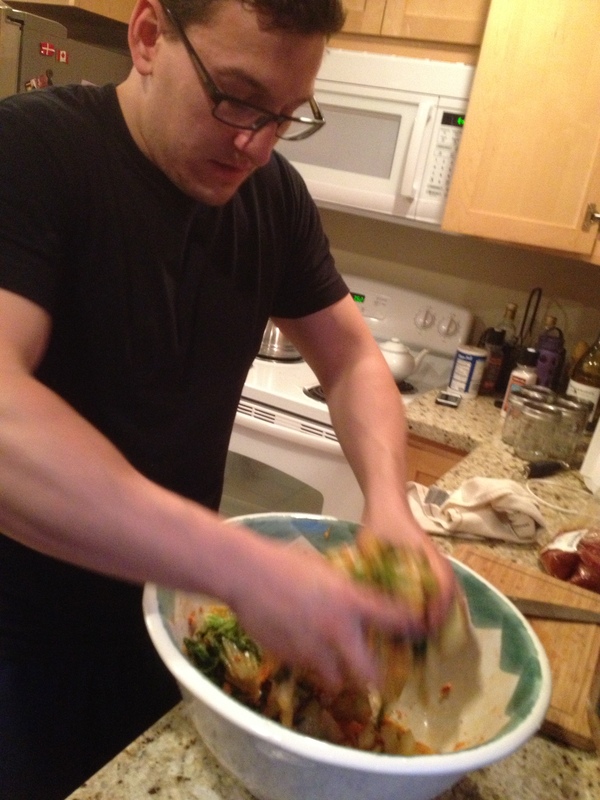 5. put onions, ginger, garlic, fish sauce, and pepper into a processor. Chop all ingredients together, they should still be very coarse. 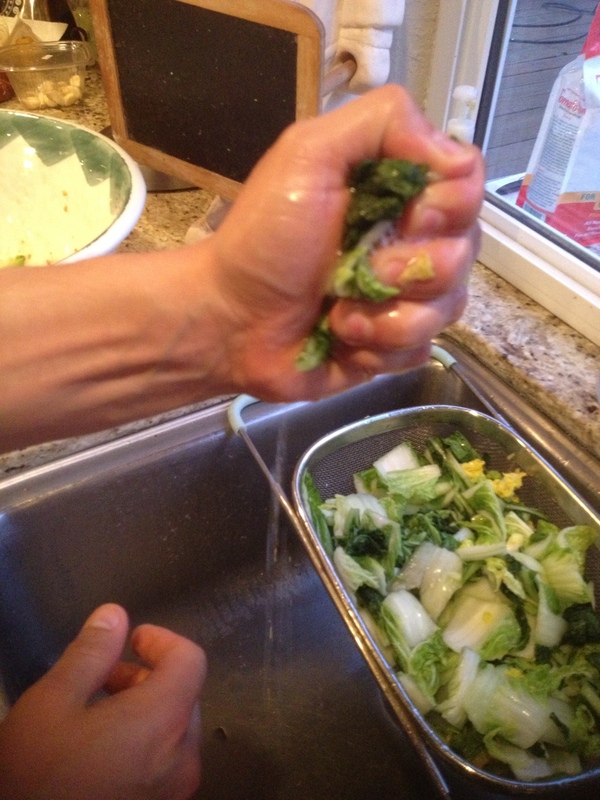 6. cabbage should be shriveling, you can mix it if you want and pour out the excess water that will be at the bottom of the bowl. For some reason on Wednesday night I always feel like eating chicken. It must be because whenever I ask my kids what they want to eat for dinner they usually respond with either Mac and Cheese (Not the home made one, which I know how to make, but the boxed one. GROSS!! Never again!! ), Noodles (They mean Top Ramen or Maruchan instant noodles. Yeah… NO. ), or Chicken and Rice. I always opt for the chicken and rice because the prep is next to nothing. Then I either hang with them in the other room while they play, or I have them help me bake something for dessert. Wednesday is a very chill day. A day to rest from the non-stop weekend up to Tuesday. There’s always something going on and it’s busy busy busy. So last night I defrosted 4 leg quarters (leg with attached thigh) and I cut the legs off of the thigh, seasoned it with Montreal Seasoning and Garlic Salt and then popped it in the preheated oven. The recipe below is for two of them. The other two I made a curry with which I have posted HERE. The rice is incredibly easy to make especially if you own a rice cooker. I don’t know about you, but I don’t measure the water using the lines on the pot. I use my finger. Does anyone else do that? I know you’re out there. 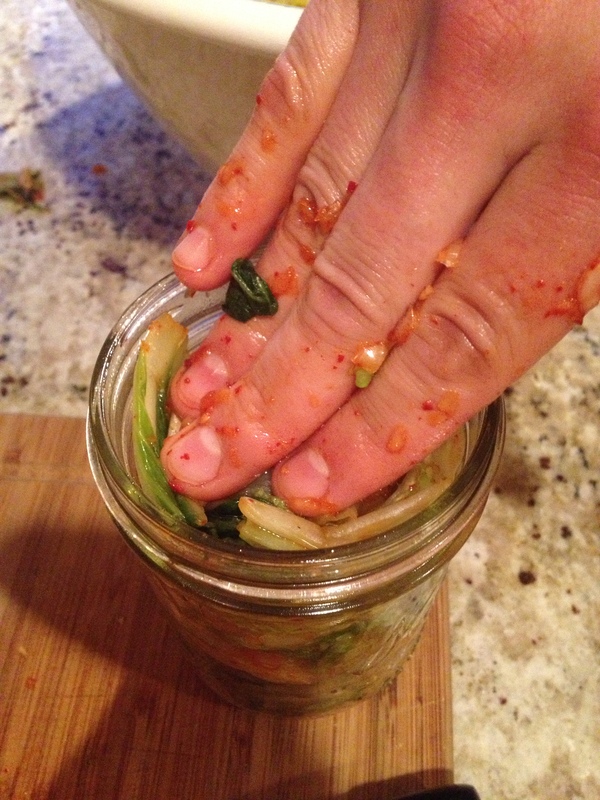 Making it in a pot is easy as well, but be careful about burning the bottom. 2. 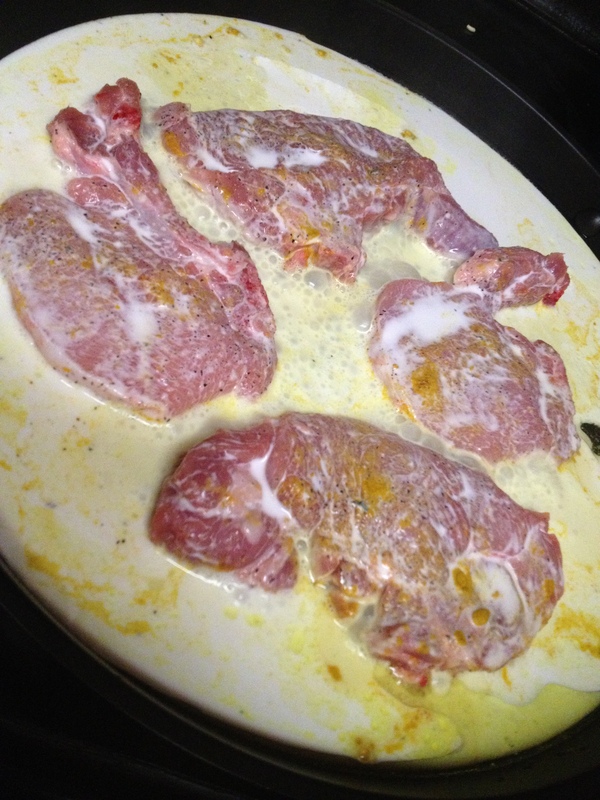 Get your baking dish/tray and grease it up with coconut oil/butter/bacon fat/or anything else that is Paleo friendly/will keep your chicken from sticking to the dish. 4. 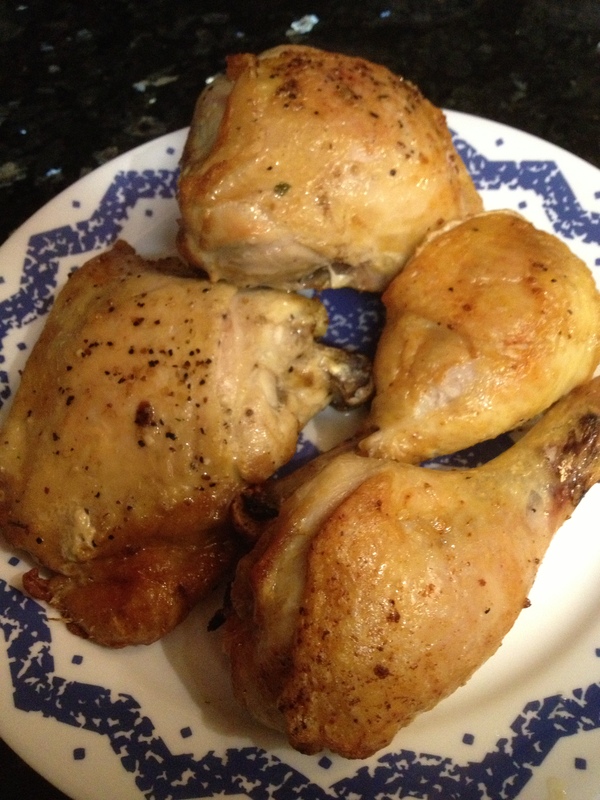 Place chicken on bakeware and pop in oven. 5. Bake for 20 minutes and flip. Then cook for another 20 minutes. I don’t eat rice so I threw a small yam in the oven with the chicken. When I flipped the chicken I also turned the yam. They both come out at the same time. Easy peasy!! 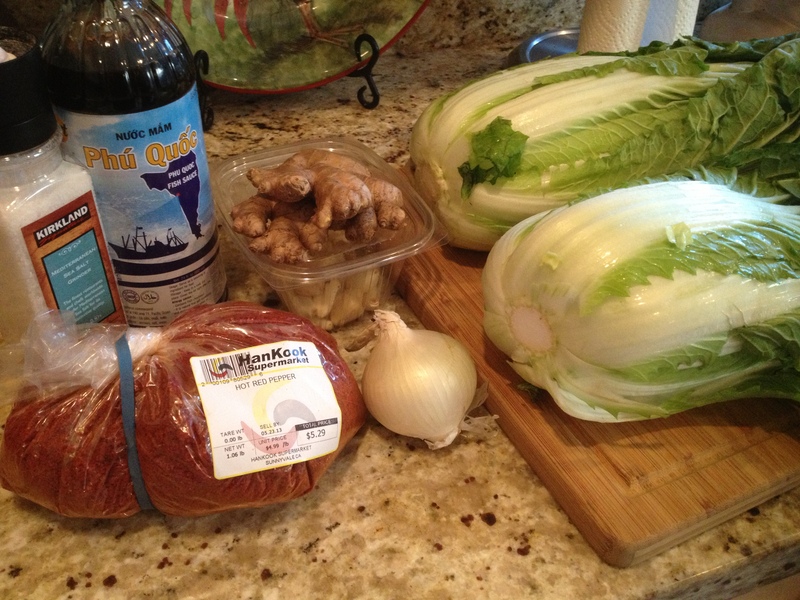 While all of this was cooking I experimented with home made Paleo friendly ice cream. I will make sure to post the recipe, the pictures, and the review tomorrow. I don’t have a fancy shmancy ice cream maker so it took a couple of hours of babysitting it to make sure that it was coming out right. I checked it this morning and yes… it came out right. Again, I’ll post about it tomorrow. 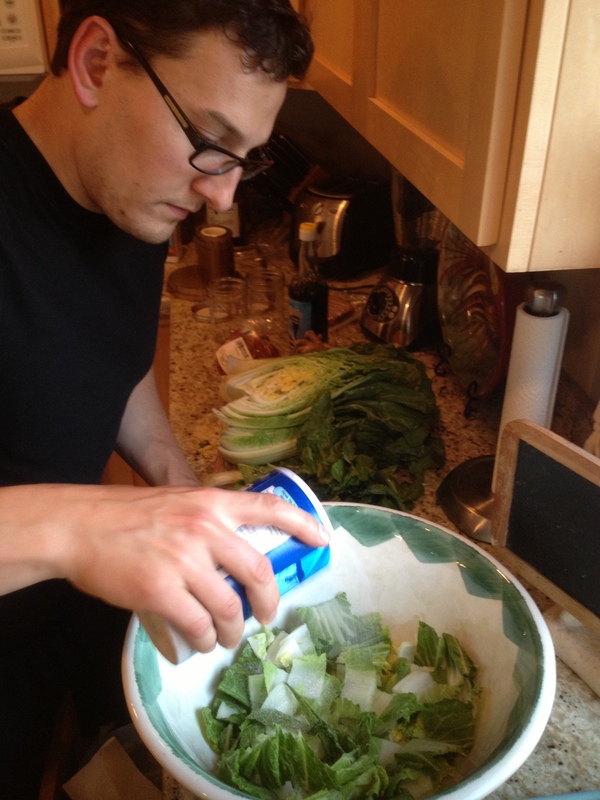 Edit – 4/12/13: Here is my recipe for the home made ice cream. Anyhoo… in the box this week I got a bunch of Rainbow Carrots. 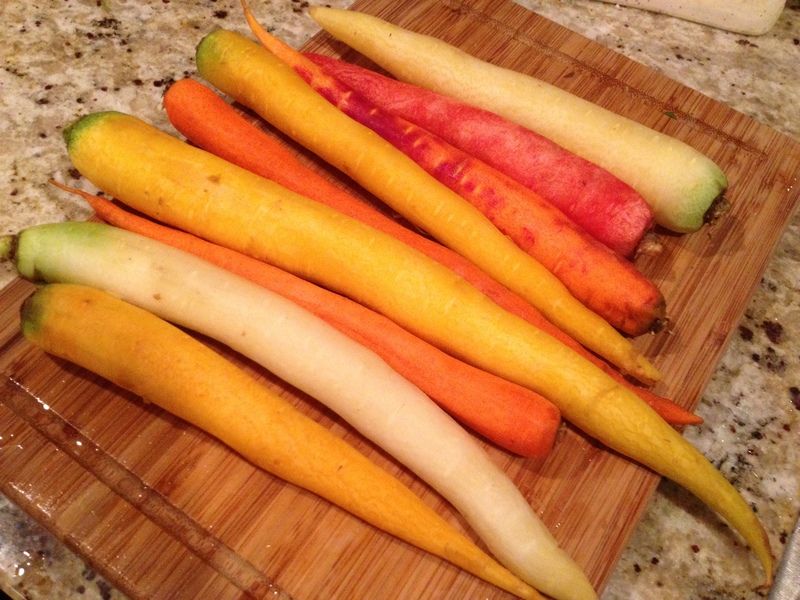 Who knew that carrots can come in colors other than orange? Each carrot has a different flavor to it and I would have to say that the traditional orange that we all know is still my favorite. If I get a vegetable in the box that I have no idea how to cook, I usually look up different recipes and pick one that sounds the tastiest. 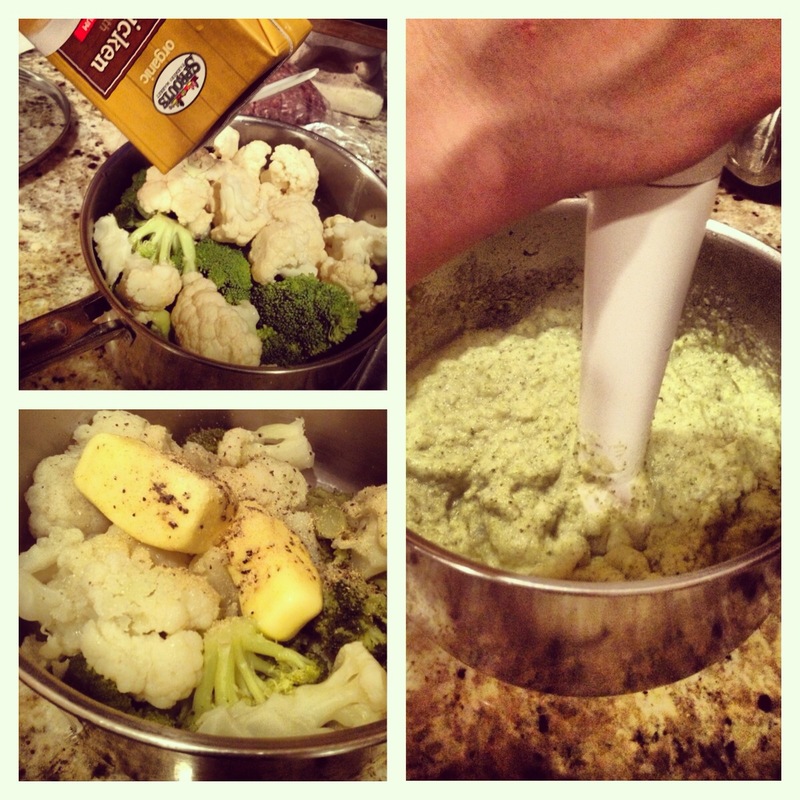 For this particular veggie I went with a simple roast and easy herbed garlic butter recipe. 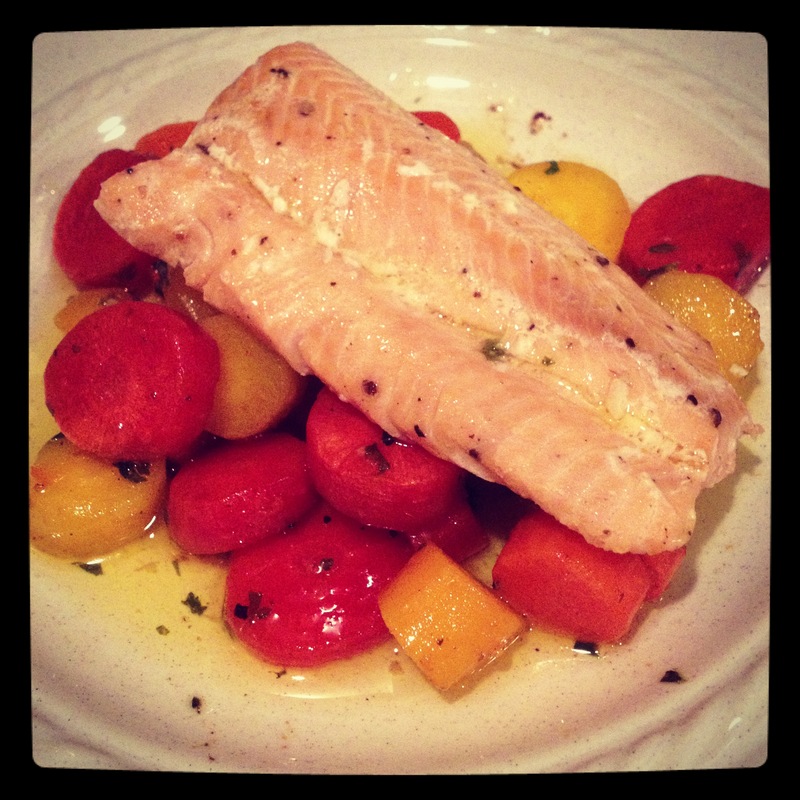 It had also been a while since my last seafood dish so I figured salmon would pair up perfectly. The fish that I used was frozen wild caught salmon that I purchased at Smart and Final. Fresh is always better, but this is what I had on hand last night. Please note that I do not measure when I cook so all measurements listed below are guesstimates. Note: So for this recipe I had leftover bacon grease from when I cooked bacon for a tuna salad recipe that I had made as a pre-workout snack earlier. If you don’t have bacon fat then you can use coconut oil or even butter. I also used the same pan that I cooked the bacon in and this pan happens to be oven safe. If you don’t have an oven safe pan then a baking dish is absolutely fine. The recipe below is how I cooked it with the pan, and I add additional instructions if you are using just a baking dish. 1. Preheat oven to 350F and Preheat oven proof pan on stove at medium high heat to melt the bacon fat/coconut oil/butter. 2. When your pan is hot and what you put in it has melted put in the carrots. 3. 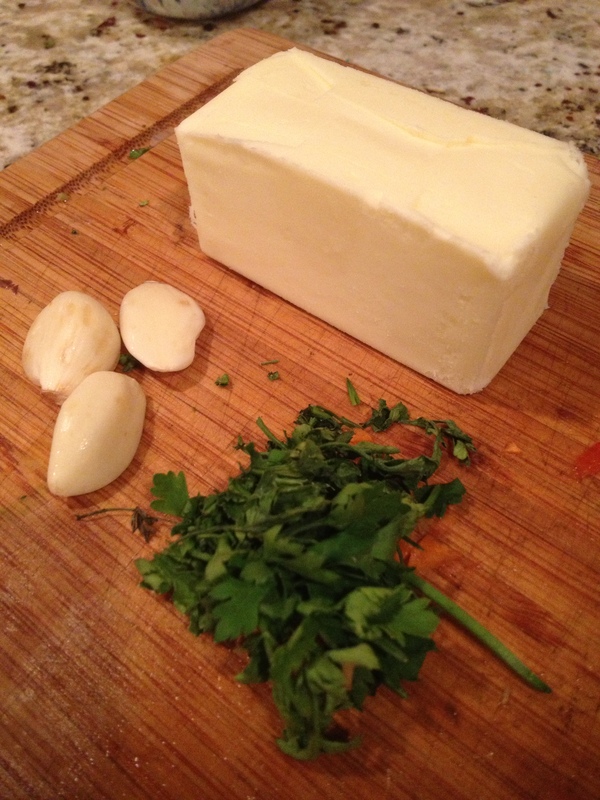 Melt the stick of butter and while that is melting, mince up the garlic and parsley. Mix. 4. Stir your carrots that are sizzling in the pan. 6. Stir to evenly distribute the butter mixture. Note: So if you’re just using a baking dish, you can use two sticks of butter with the garlic and herbs. 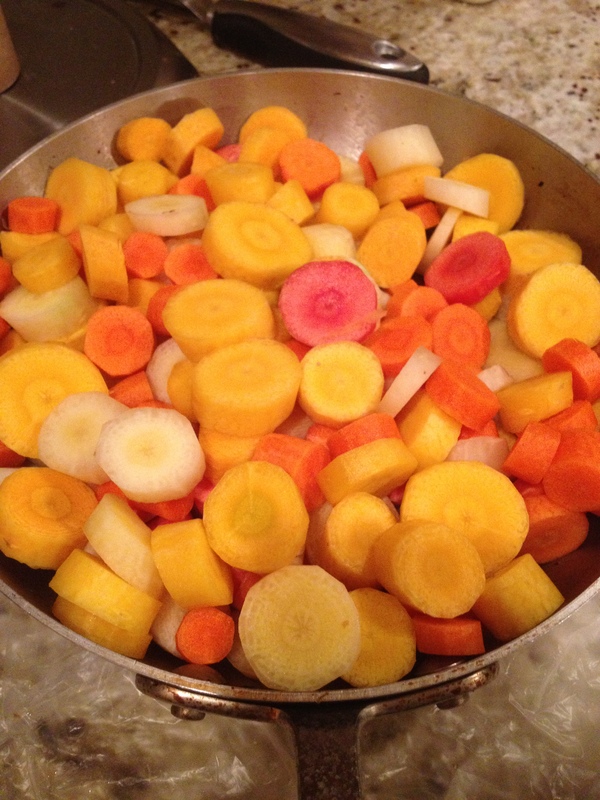 Pour it over the carrots and then you stir/mix the carrots in the melted butter so that it’s all coated evenly. Pop it into the oven for 30-45 minutes and DONE! 2. 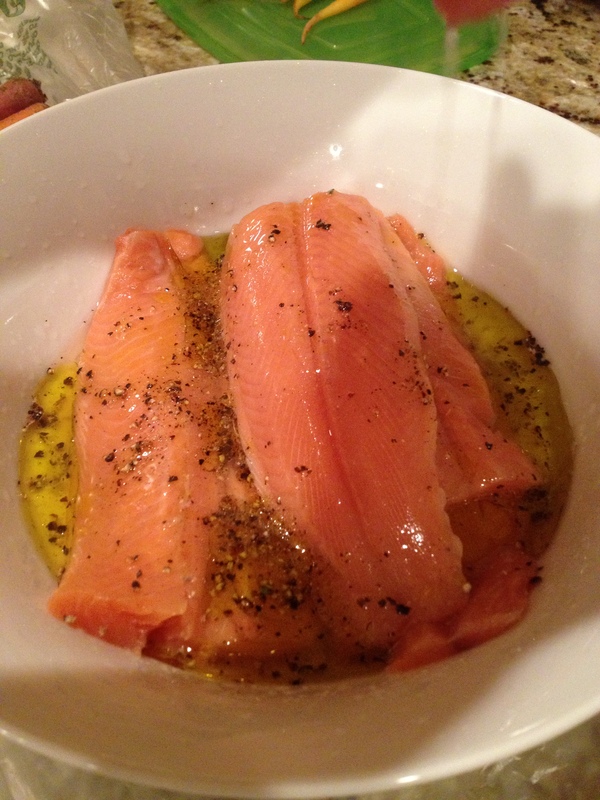 Place your salmon fillets in a bowl and add all ingredients. 2. Make sure that all sides of the fish is evenly coated. 3. 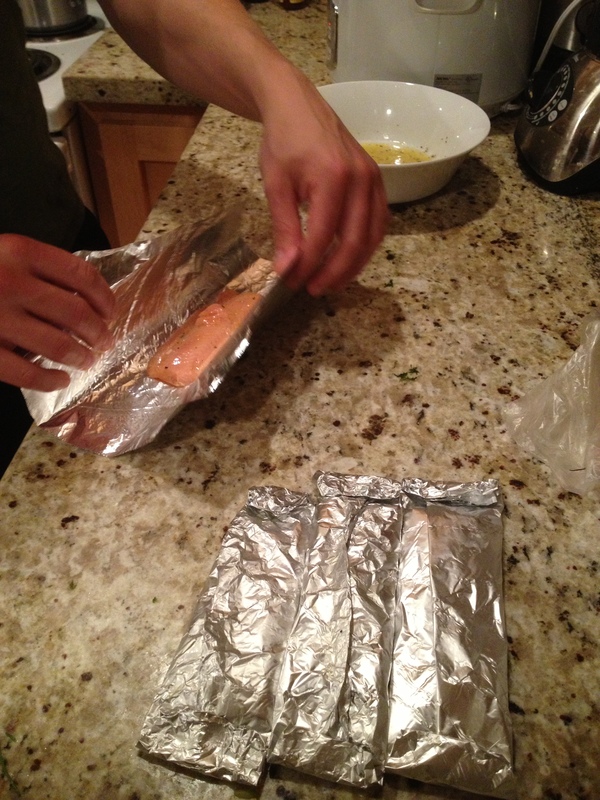 Grab foil pieces big enough to wrap the fish. 4. Put fish on the grill and cook for 5 minutes on each side. Fish is cooked when the meat flakes easily when you prick it with a fork. Super YUM!! 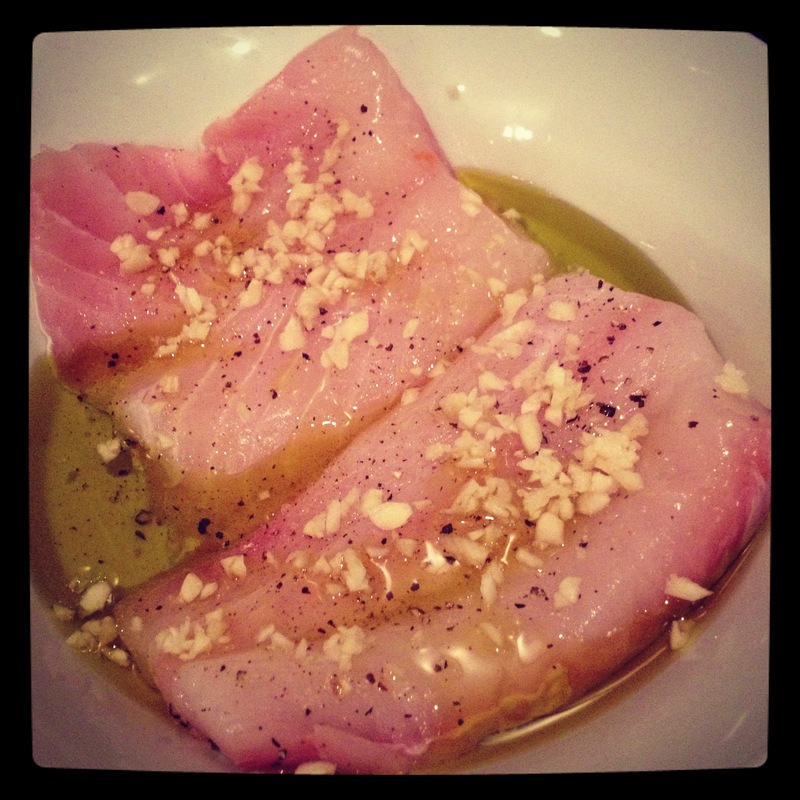 I ended up pouring some of the butter sauce over the fish and that added more flavor. Hope you enjoyed this dish as much as I did!! ENJOY! 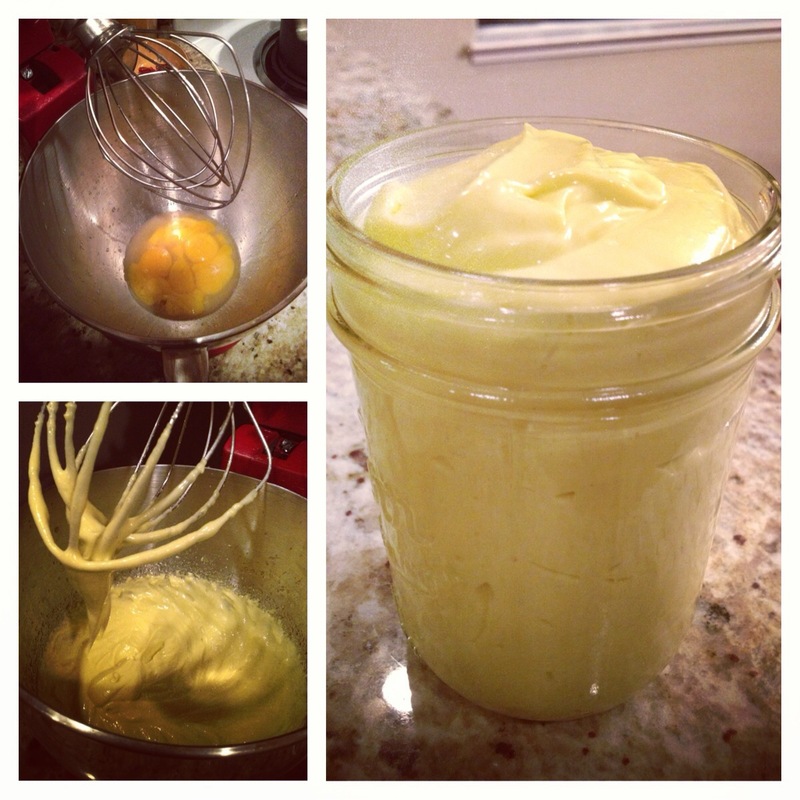 I didn’t realize how easy it was to make mayonnaise at home until the boyfriend made it. No really, it is ridonkulously easy and although it doesn’t last as long as the conventional mayonnaise that you can get at the store, I guarantee that it’s tastier and healthier. I highly recommend that you get an electric mixer of some sort to help with the mixing because it is A LOT of mixing. Sure you can do it by hand, but it’ll be a whole lot easier if you have an electric one. 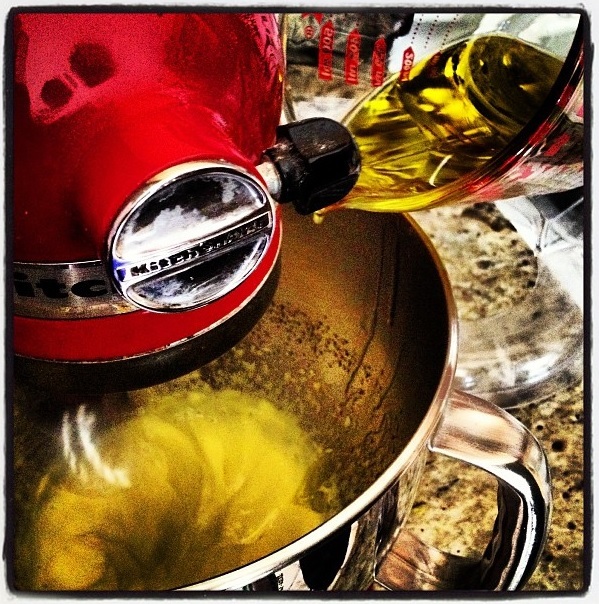 With this recipe, a stand mixer was used. Please note that I don’t measure when cooking so all measurements listed below are guesstimates. 1. 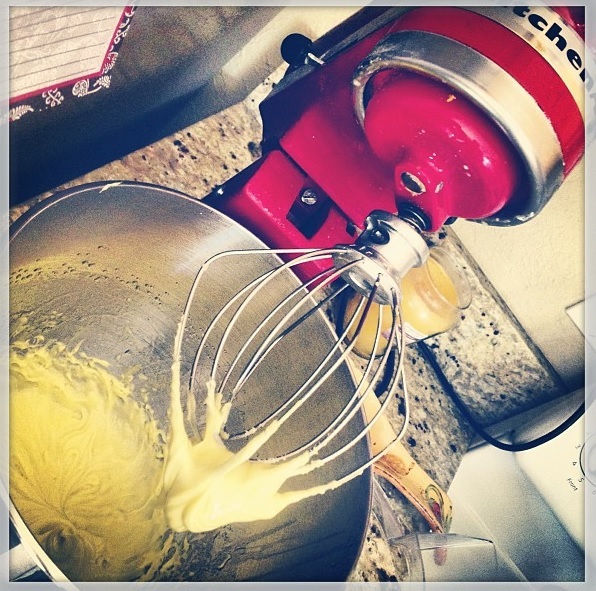 Put egg yolks into the bowl and turn mixer (with the whisk attachment) on to the highest speed. Leave it to do it’s thing for about 2 minutes. 2. 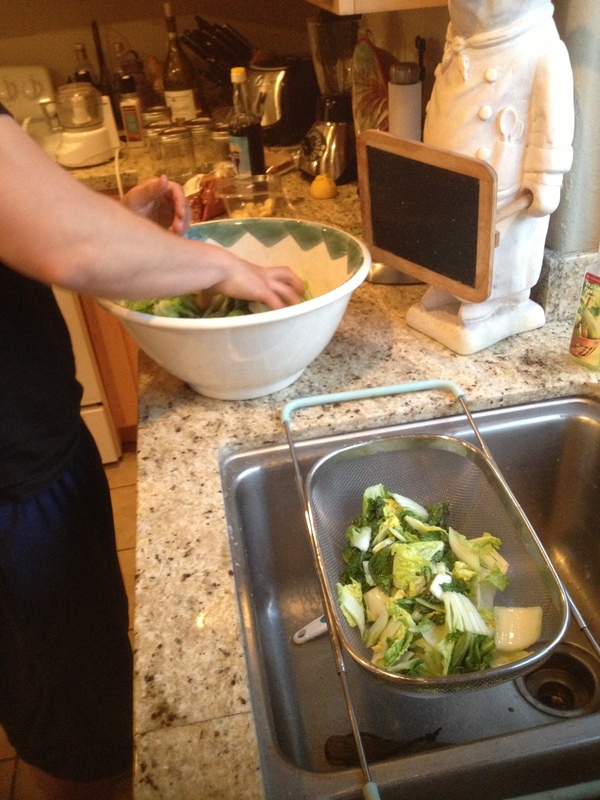 Add the vinegar/lemon juice, salt, and mustard (optional) to the bowl and mix for 30 seconds. 3. Now pay attention here: Add oil in SLOWLY!! I’m talking drops, or a very VERY small and slow stream. You don’t want to add the oil in too fast because then the eggs won’t absorb the oil. It’ll curdle up. Just do a little at a time, perhaps a tablespoon, until about 1/3 to 1/2 a cup. 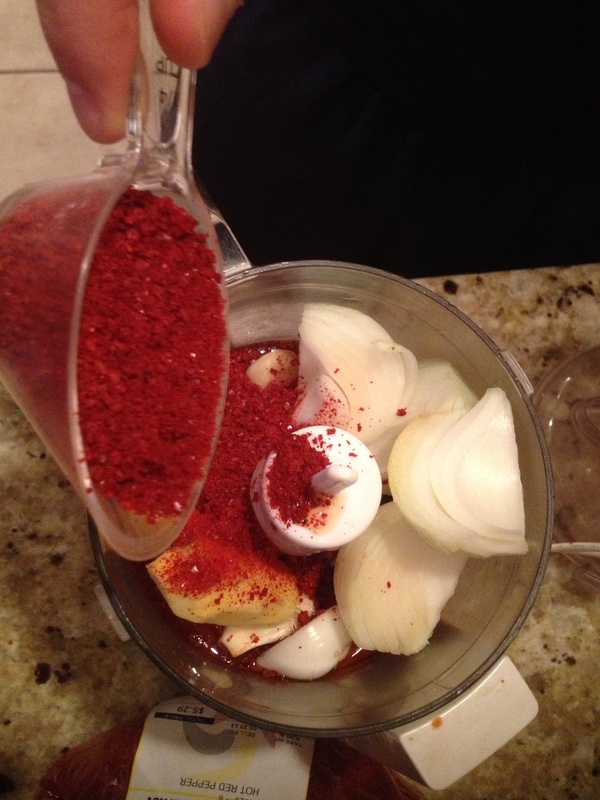 Make sure that the oil has incorporated into the mixture before adding more. After that you should be able to add the oil in a bit faster. Keep in mind that the mixer stays on high this entire time. 4. The mayonnaise is complete when you’ve poured in all of the oil, and when you lift the whisk from the bowl it’s thick and creamy. This recipe should make about 2 cups. 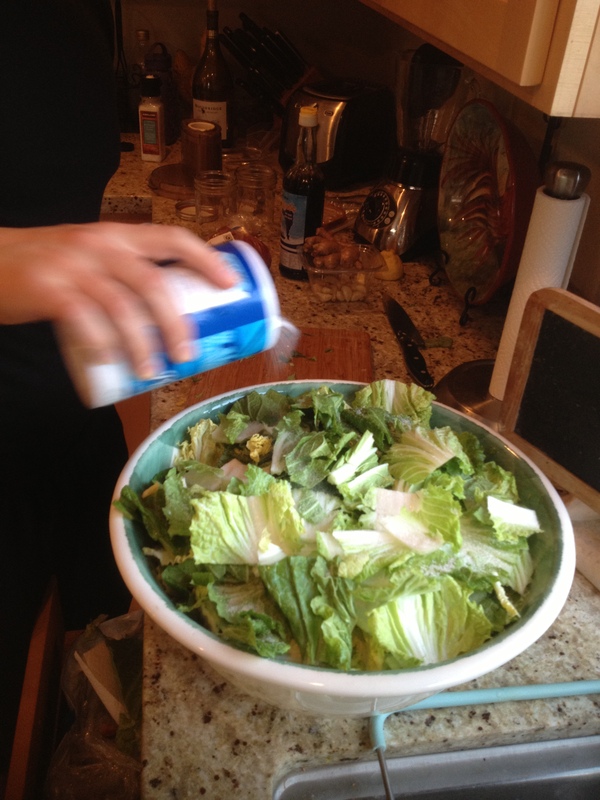 The mayonnaise can be used right away, or you can store it in an airtight container in your fridge. Expiration… Depends on when you got your eggs. If you got them farm fresh, then it is a month after first pick date. If you used conventional eggs, then go with the expiration date on the package. ENJOY!! I had made this the other night hoping that my boyfriend would like it because he had mentioned to me before that he wasn’t a fan of pork chops. I personally find it super tasty so I made them. There’s a store next to where I live called Manila Oriental Market, or I like to call it MOM’s. It doesn’t have the best customer service, but if you’re looking for Asian food that’s where I go. The meat selection is huge and so is the seafood. I couldn’t tell you if they had grass-fed or wild caught items there and believe me I’ve asked, but I don’t think they understand what I’m asking. I’ve given up trying to find out and just smile, point, and raise my fingers to indicate how many pounds of that particular protein that I want. the trick is to know what you want so that when they come to you there’s no attitude. Oh and it always helps to smile and say thank you. On this shopping trip I picked up some pork chops and a pack of yam noodles. Since I’ve changed my eating ways to that of the caveman I’ve been exploring alternatives to eating grains. 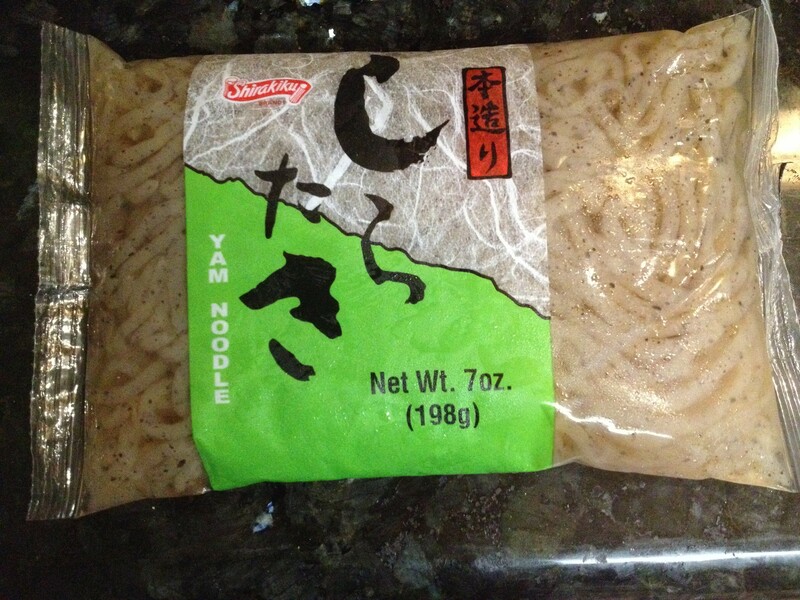 These noodles made of yam made an excellent substitute to the rice noodle. 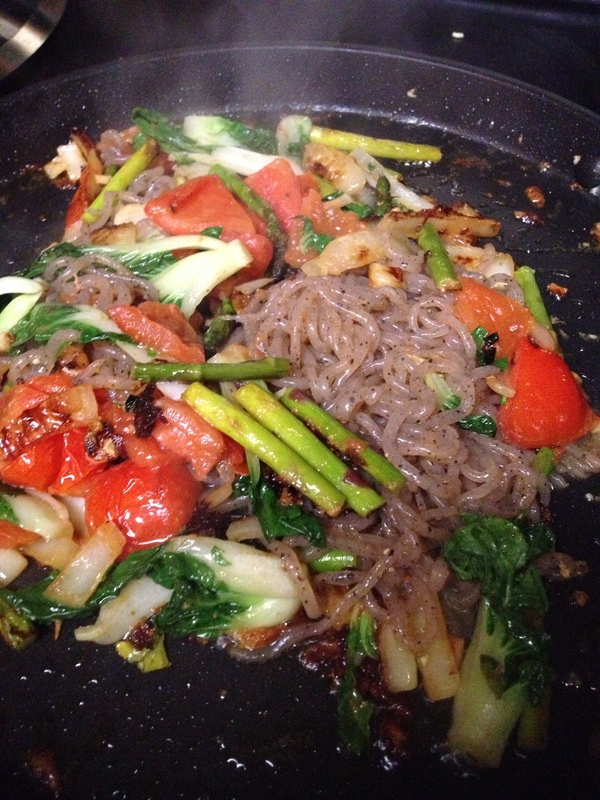 There ‘s also shirataki noodles (Though make sure you check the ingredients on the bag because sometimes they sneak a little sugar or even soy into it) or even, my personal favorite, Konjac Glucomannan (The first noodle alternative I’ve tried and it’s purely the ground konjac root and water. Nothing else.) which can be found HERE. The Konjac noodles come in all different shapes and sizes so if you’re feening for some spaghetti, ravioli, or even rice they have em. Plus, they’re inexpensive. Anyhoo… back to the recipe. Please note that I don’t really measure when I’m cooking. I pretty much eyeball everything so all measurements listed are guesstimates. Please add a little bit of seasoning at a time and taste taste TASTE! Salt and Pepper or any other seasoning that you like to use. 1. Preheat your pan to medium high to high heat with your coconut oil in it. 2. 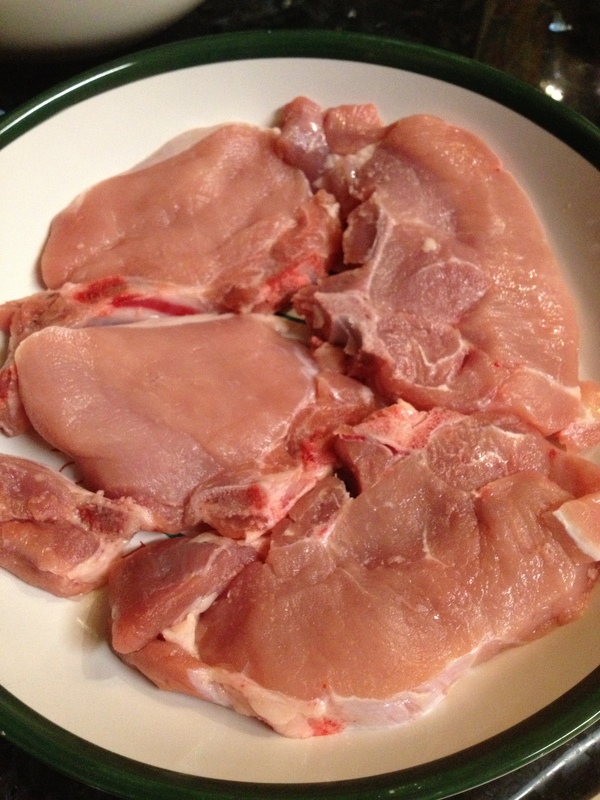 Season your pork chops with the ingredients. 3. 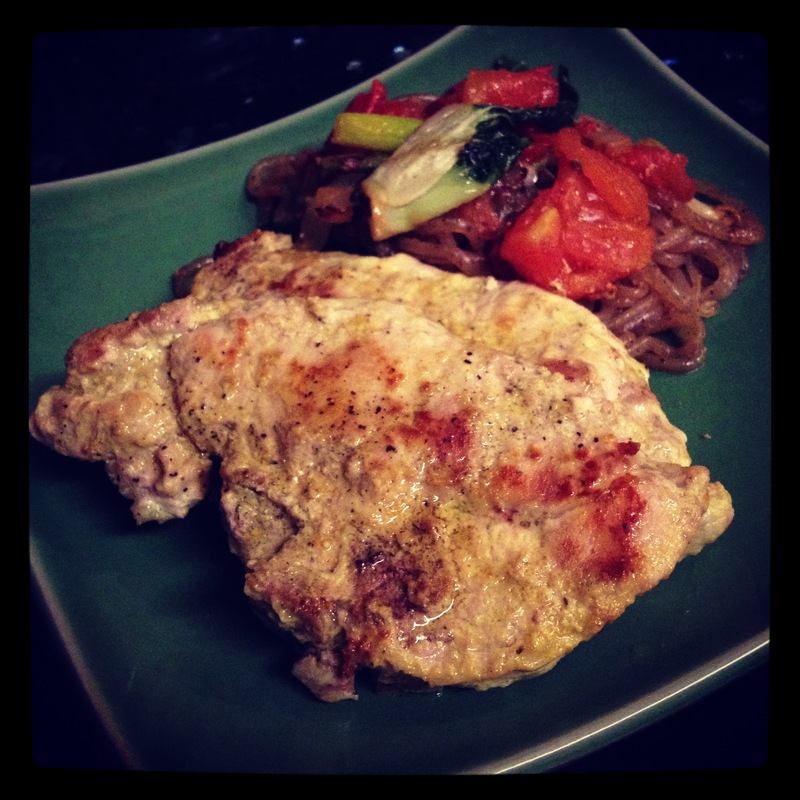 Place pork chops on the pan. Sear each side for 2 minutes. Turn heat to medium. 4. Pour coconut milk into pan. Let cook for about 5-7 minutes. 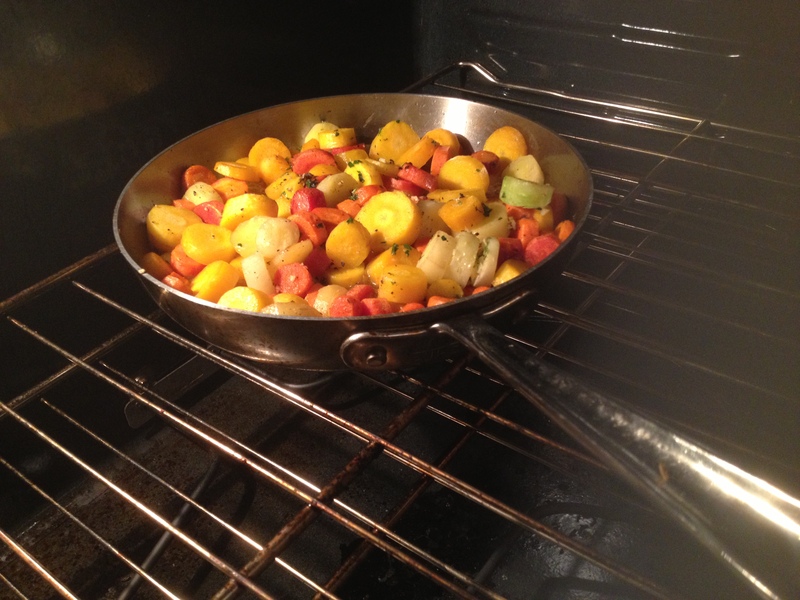 For this next recipe I pretty much used the same pan. So if you want, you can use the same pan or you can use a different pan. Entirely up to you. I figure I’m going to use the same seasonings on my stir-fry anyway, so why not? Less mess for me to clean up in the end. 1. Make sure the pan you are using is on medium to medium high heat and you have some coconut oil in there. 2. 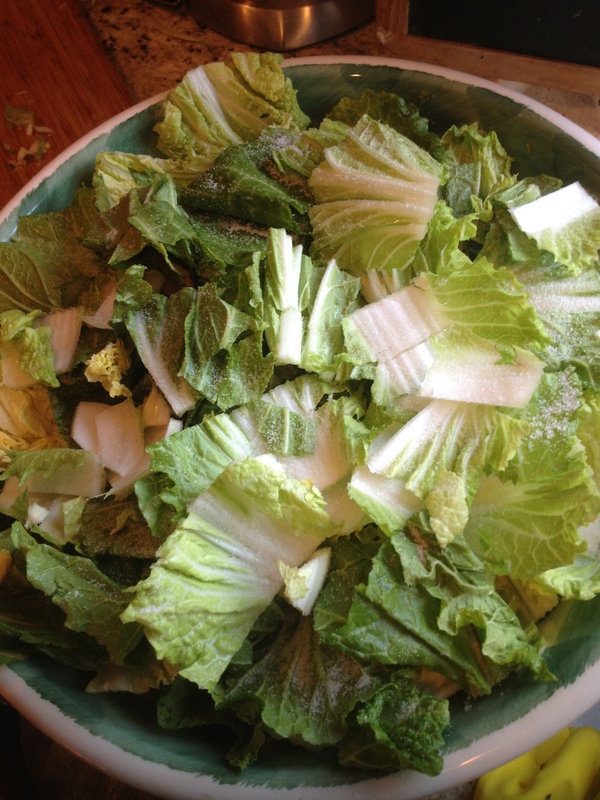 Just do a rough chop of all of your vegetables. 3. 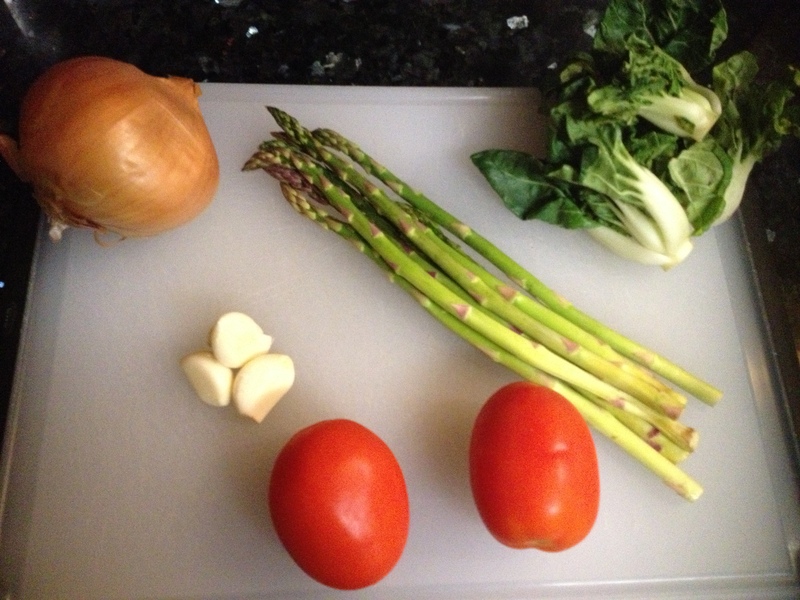 Throw in the onions and asparagus. When the onions are nice and caramelized (3-4 minutes) you can add the garlic and tomato. 5. 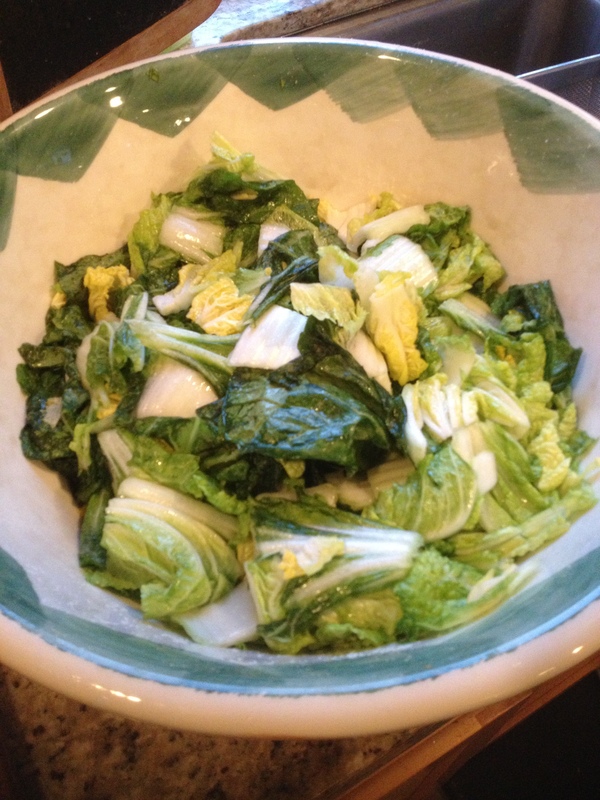 Add baby bok choy and cover pan. Cook with lid on for about 3-5 minutes. 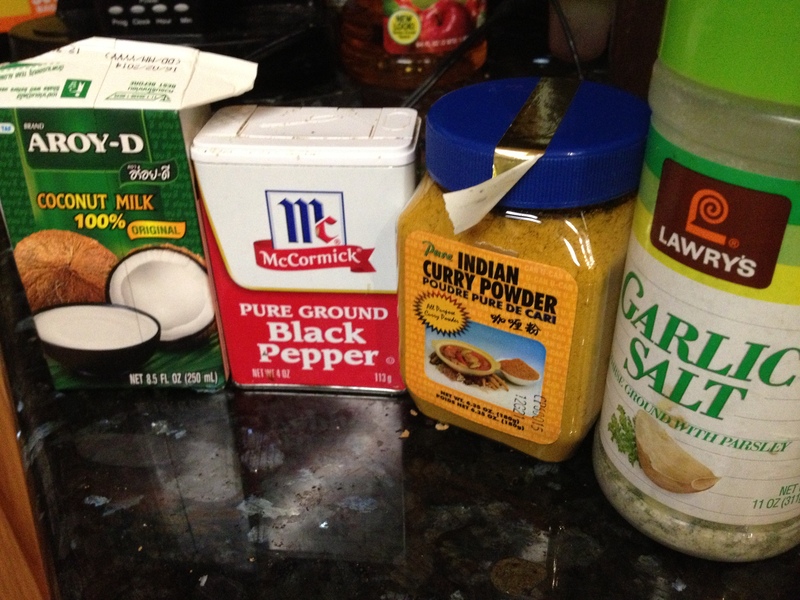 Note: I didn’t add seasoning to this recipe because I had re-used the pan and it was plenty seasoned with the coconut milk, the curry powder, and the salt and pepper. If you decide to make it on your own feel free to add whatever you like. If I hadn’t made the pork chops I probably would have added some freshly minced ginger, low sodium soy sauce,and perhaps some mirin. Hope this meal was amazing for you. ENJOY! Can I tell you how much I love being a carnivore? There’s nothing wrong with being a vegetarian or a vegan and I must admit that I went vegetarian for a week because a girlfriend of mine challenged me. Challenge ACCEPTED!! Though I must say that it was a lot tougher than I thought it was going to be. My friend doesn’t eat meat at all. Not even eggs. You would think that a simple packet of instant miso soup would be fine, but apparently there is some kind of fish powder in there that wasn’t acceptable to her vegetarian ways. I did pretty good in the end. I did have a few mishaps only because I wasn’t paying attention to the ingredients, but other than that I was good. I learned that I am definitely a carnivore. 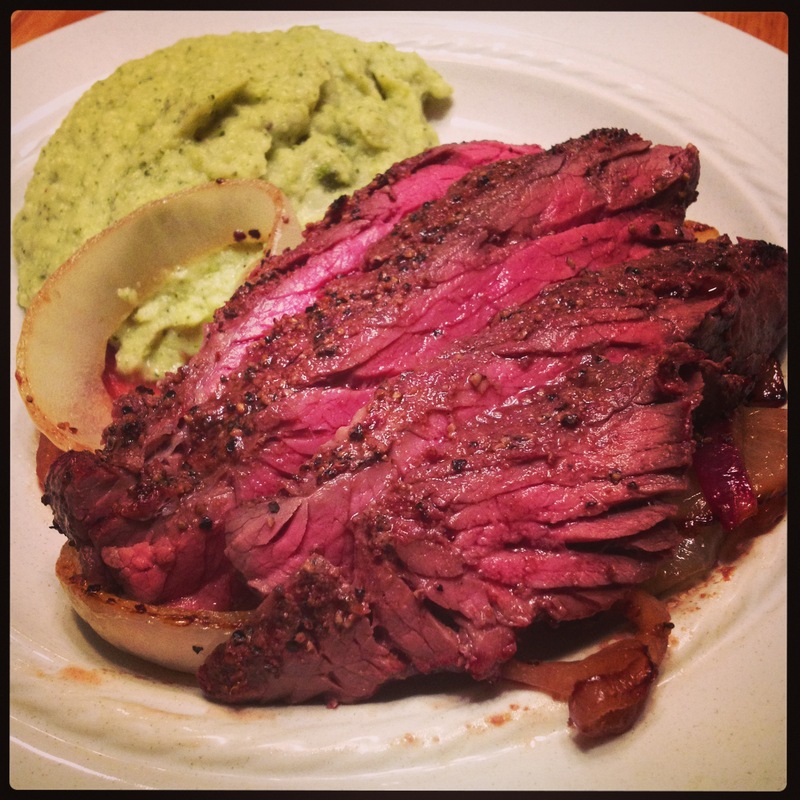 Anyhoo… most of our grass-fed steaks or roasts are purchased at a store called Lunardi’s. It’s a small selection, but it’s not like we buy much. It’s usually only what we need for whatever meal we’re having that day. 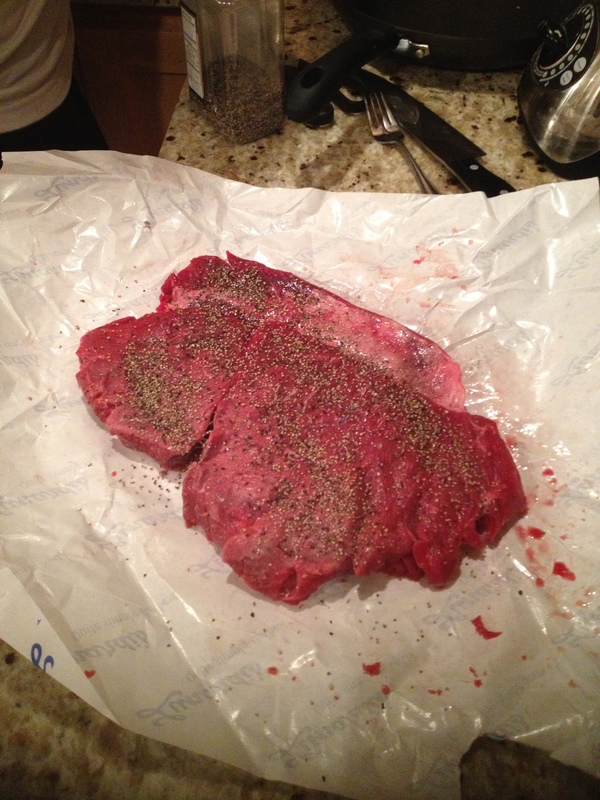 For this particular recipe we got a london broil. I believe it was about 2 pounds. The boyfriend takes a mallet to it and beats it up pretty good. Then it’s seasoned with salt and pepper. 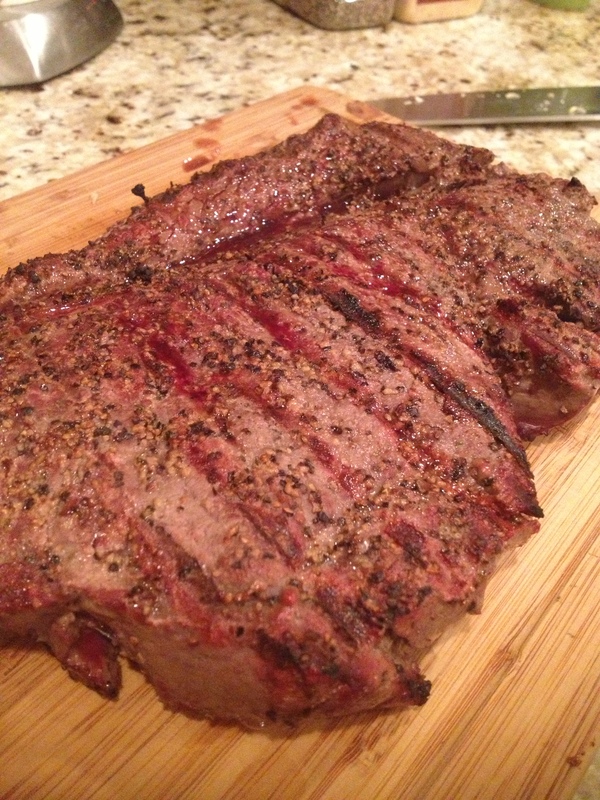 We usually keep our steaks simple. 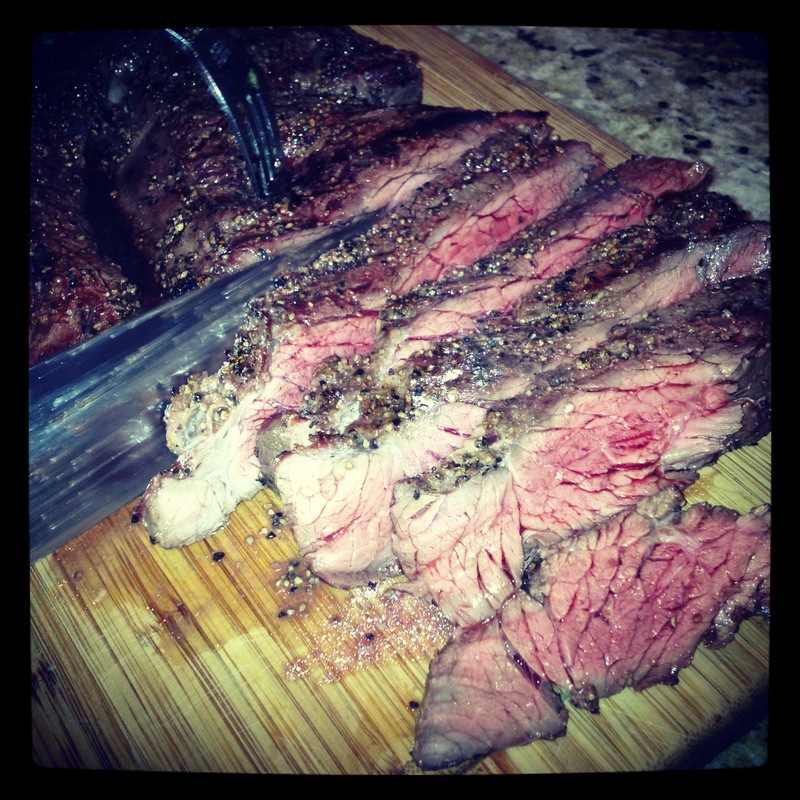 Looking at this picture makes me want steak… So for the side dishes it’s very simple. Please note that I do not measure when I’m cooking so the measurements listed are guesstimates. I’m also not very good at keeping track of how long to cook things as I eyeball it. More guesstimates. 1. Heat up a frying pan with the coconut oil on medium or medium high heat. 2. 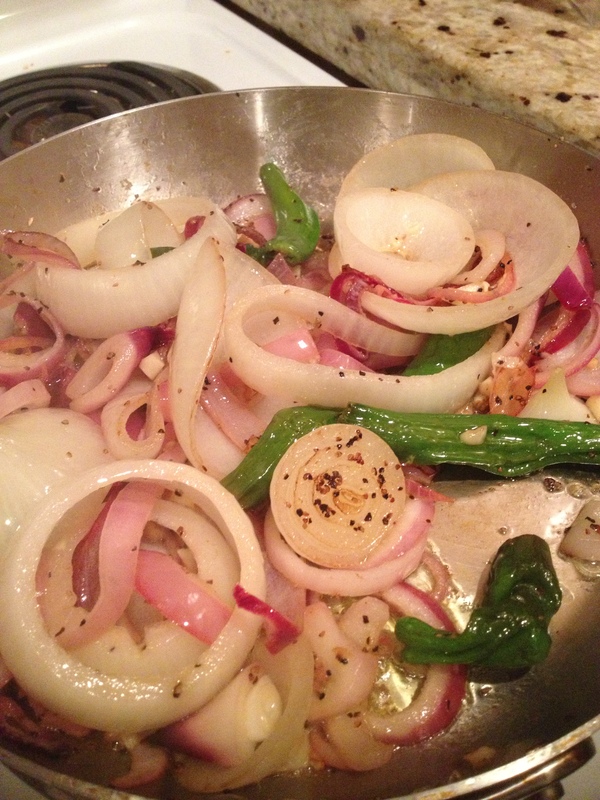 Throw in all ingredients (except salt and pepper) and sauteed it up until the onions are nice and golden. Maybe… 10 minutes. Just keep an eye on them. Of course, you don’t want to burn them. The edges should have a nice gold/brown to them. It should also lose it’s sturdy circle shape and they should be soft and limp. Add salt and pepper to your taste. 1. 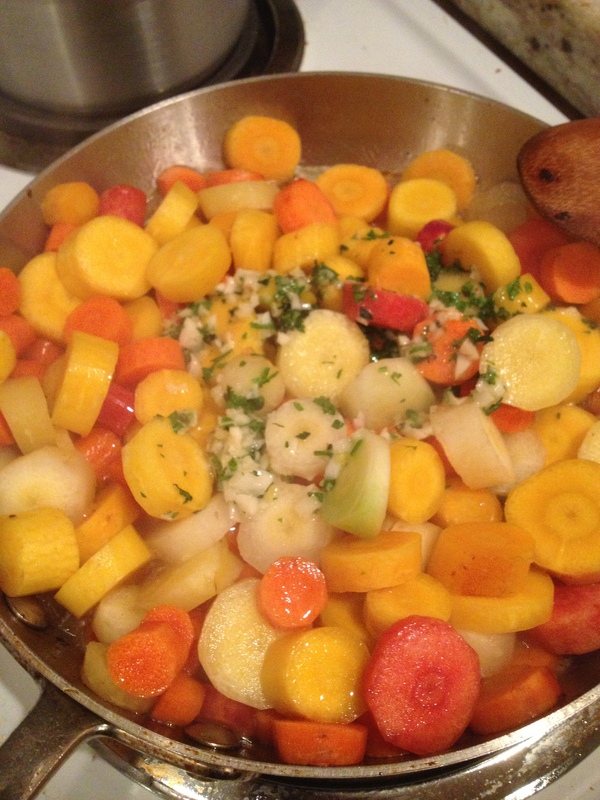 Get a pot large enough to fit all of the vegetables and the chicken stock/water. 2. Put the cover on and turn to high heat. Boil that sucker for 10-15 minutes. 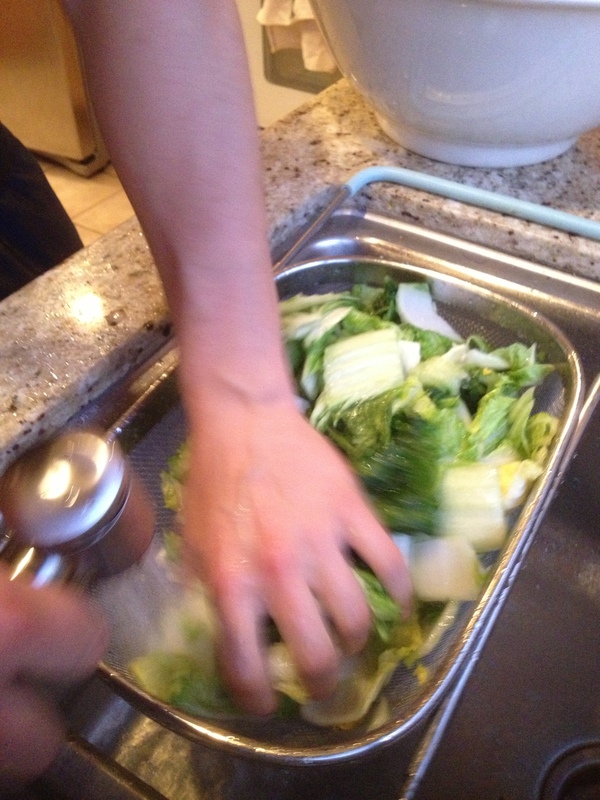 Check on it every now and again to see if the vegetables are cooked through and soft. 4. Add butter and milk/heavy cream. 5. Blend until it is the consistency that you like. 6. Add salt and pepper to your liking. By now, everything is cooked. Your kitchen smells delicious and I’m sure you are very very hungry. My boyfriend and I made this dish last night and it put us into a food coma. 1. Place all ingredients except the lemon juice in a bowl or plate. (Don’t worry… you’ll use the lemon a little later.) Toss the fish so that it’s covered all over. Let sit for about an hour or so. 2. After the wait, fire up the grill. You want it to be medium high. 4. Place the fish on the grill skin side down and let cook for 5-6 minutes. Use a spatula to flip it over and cook for another 5-6 minutes. 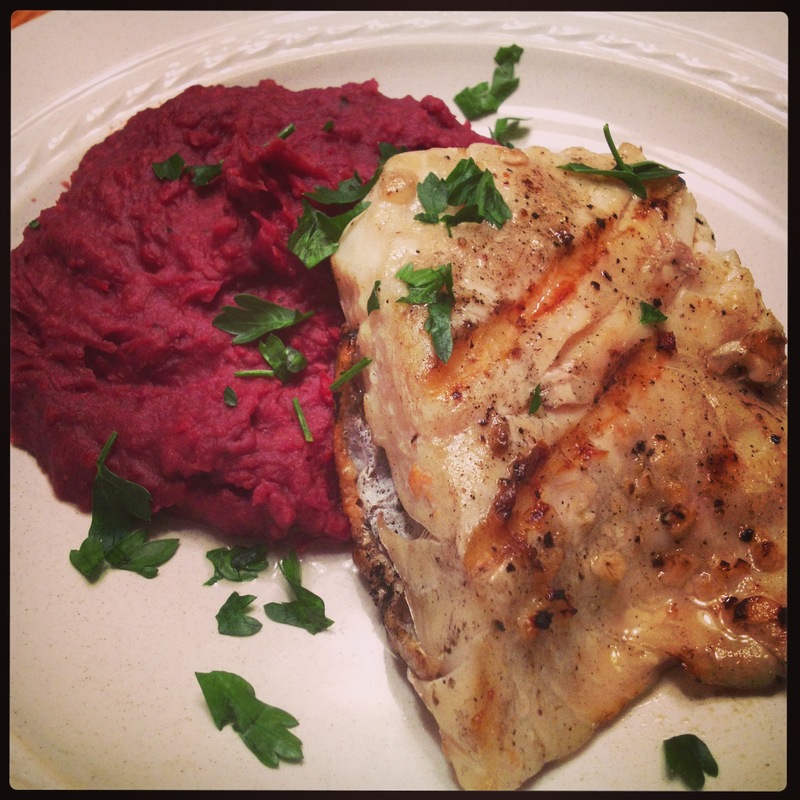 You will know that the fish is cooked when the meat flakes easily with a fork. Notes: You can also pan sear the fish using butter (REAL butter not that fakey butter) or coconut oil (don’t use vegetable or canola oil. Those are bad for you!) and it will cook at medium high heat for 5-6 minutes on each side. You can also bake it at 450 degrees F for 8-10 minutes. 1. 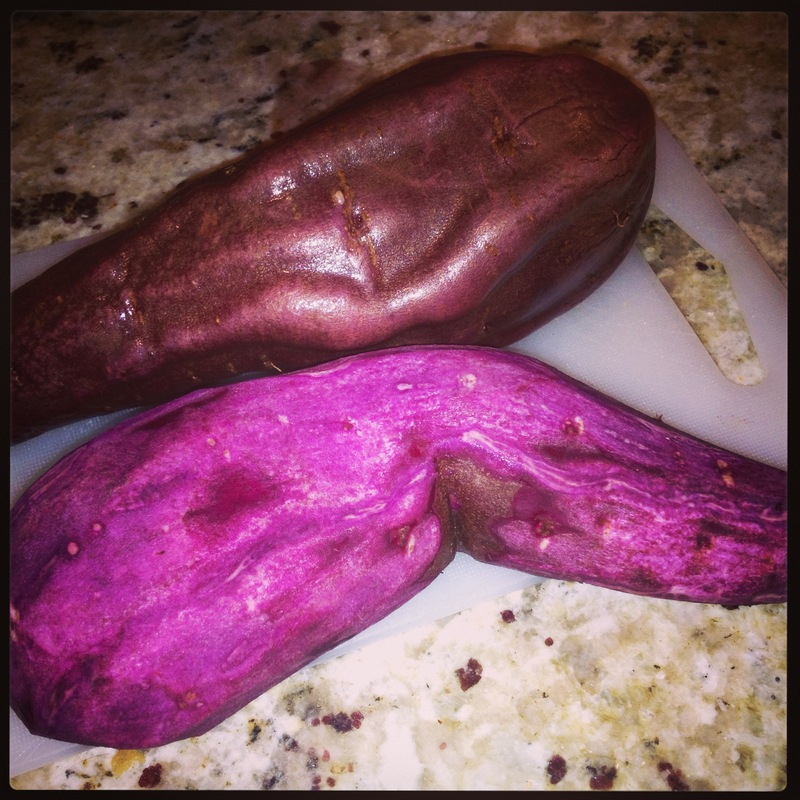 Wash your purple root, peel it and chop it up. Throw it in a pot and cover it with water. Turn the heat to high and let it boil. It’s done when you can stick a fork in them easily. Drain the water. 2. While you wait for the purple stuff get a pan and heat it to medium/medium high heat and let your coconut oil get warm. 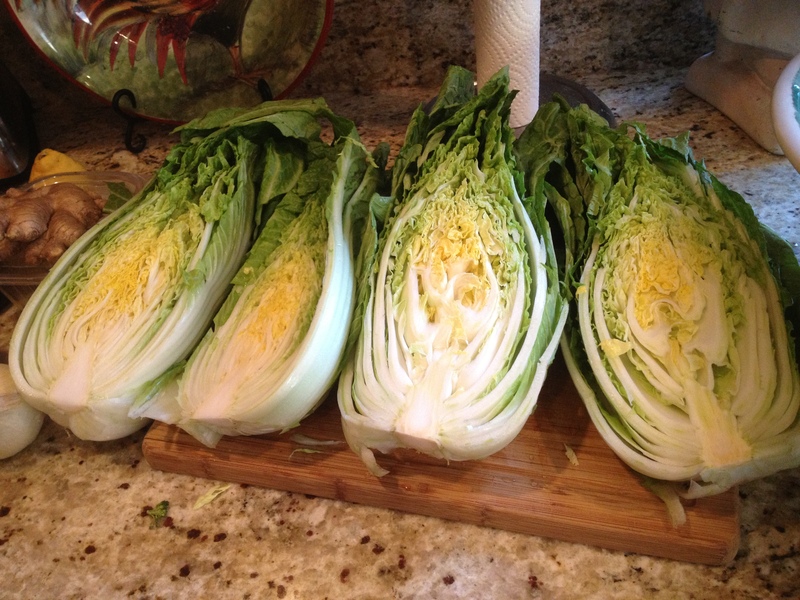 If you haven’t already prepped your veggies you can use the heat up time to do so. 3. Throw the onion in the pan and cook til they are nice and golden. 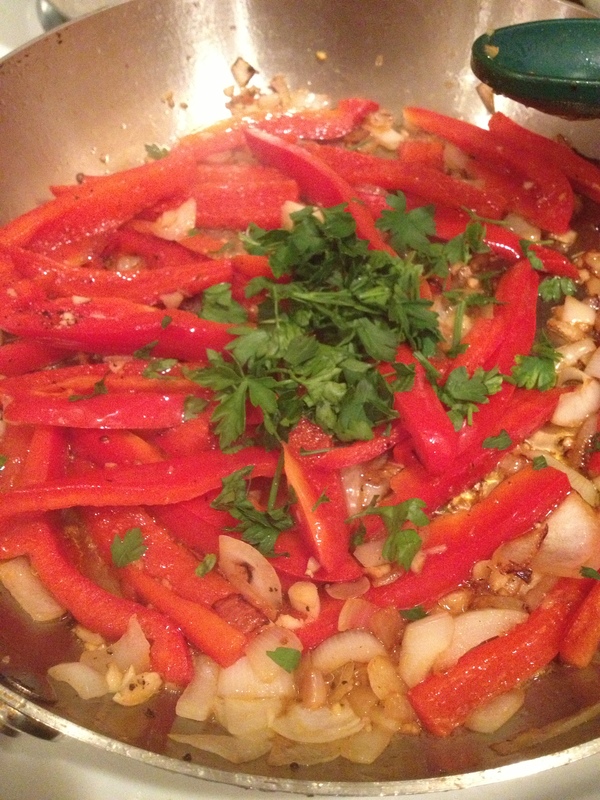 Add bell pepper and cook for 3-5 minutes. 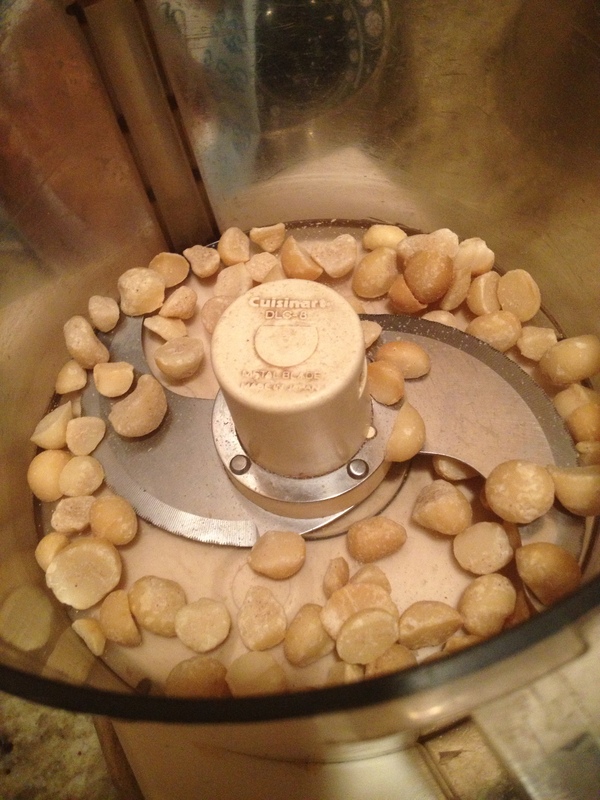 Add garlic and cook for 2-3 minutes. Add parsley and cook for 1 minute. Add as much salt and pepper to your taste. 4. So by now the purple stuff is cooked and the other veggies have been sauteed nicely. Grab a food processor and throw everything in. 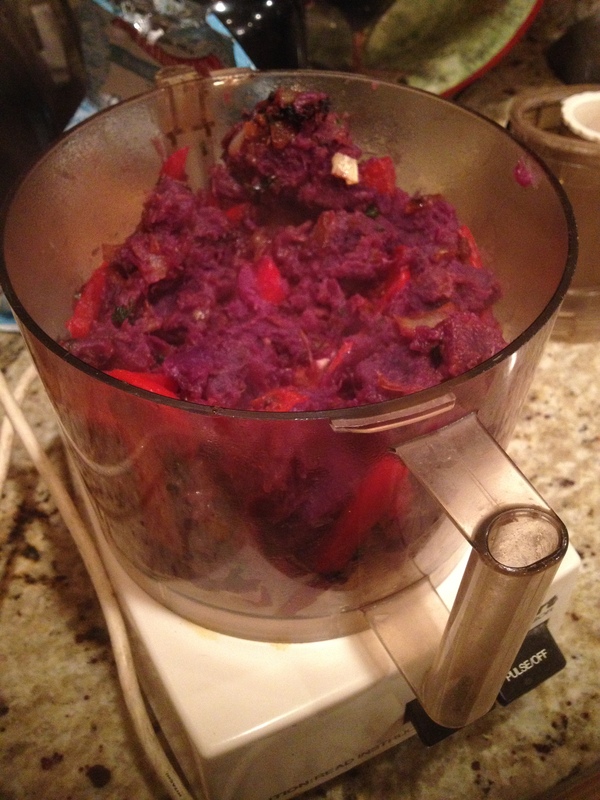 (Purple stuff, veggies, macadamia nuts, and butter.) Puree it all! If it is too thick for your taste you can add a little milk til it is the consistency that you like. 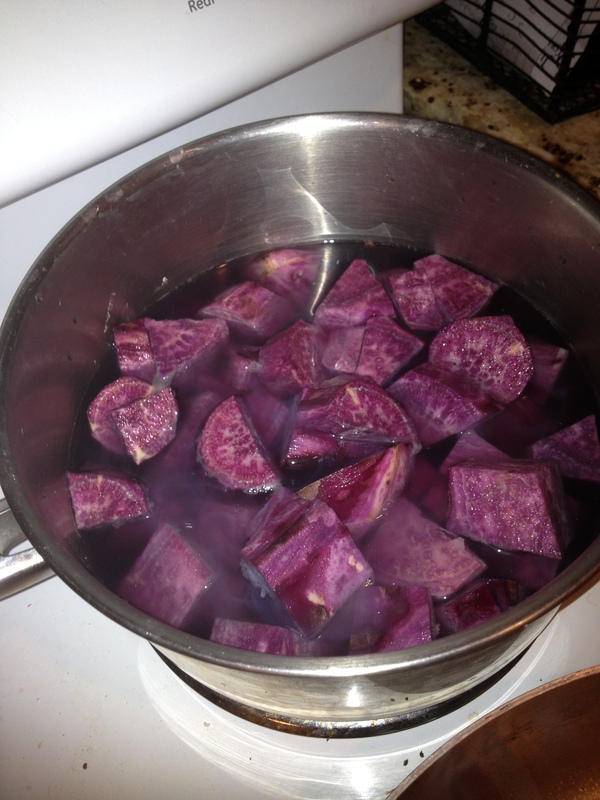 Notes: I think for next time I will cook the purple yam in chicken stock or beef stock to give it a bit more flavor. For you vegetarians out there you could even use a vegetable stock to cook it in. And there you have it! Serve while everything is still hot/warm and ENJOY!